SUNNY ISLES BEACH, Florida – The United States Bartender’s Guild (USBG) recently hosted another outstanding event where Flair meets mixology the “USBG World Cocktail Championship – USA qualifiers” sponsored by Finest Call, Simply Squeeze Real, Ketel One Vodka, BarProducts.com, Flairbar.com and the United States Bartenders’ Guild. Held at the beautiful white sands of Newport Beach Hotel & Resort, 10 outstanding bartenders from across the United States were gathered in good spirits to determine this year’s official representatives at the upcoming IBA to be held in Cape Town, South Africa (Champion) and the Pan-Am in Mexico (Second place). To be an eligible competitor, one must be a current USBG member, submit a 500 word essay or less stating “Why should you be given the chance to compete?”, an original cocktail recipe and a 4- minute Flair video clip. In my humble opinion, the USBG World Cocktail Championship acts as an “equalizer” between bartending’s two disciplines Flair and Mixology. 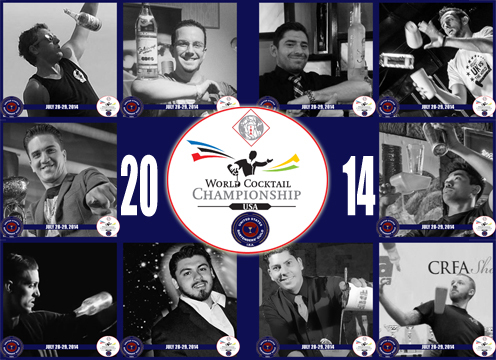 The top 10 bartenders with their respective USBG chapters who made it to the qualifiers were Manuel Picon (Miami, Florida), Will Isaza (Boston, Massachusets), Luis Ortiz (Las Vegas, Nevada), Eric Parker (Las Vegas, Nevada), Mariano Gil (Houston, Texas), Colby Good (Las Vegas, Nevada), Dario Doimo (Las Vegas, Nevada), Danny Seigel (Miami, Florida), Ram Ong (New York, New York) and Joshua Goldurs (Key West, Florida). The USBG Flair committee has selected reputable judges and some of the best industry leaders for this event to ensure fairness and quality results. Flair judges were Chris Cardone, Graham Kimura and Rob Turek. 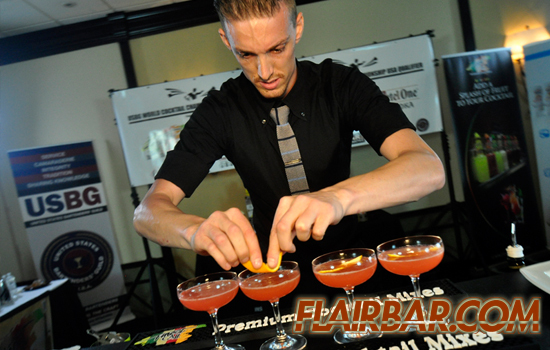 While Brittany Chardin, Rob Montero and Brijette De Berardines were the mixology judges. The Spirited Dinner hosted by generous sponsors Finest Call & Ketel One took place on the first night at a “Top Hot Spot” called Kitchen 305. Excellent food was served that night from appetizer Spicy Tuna Tartar followed by the Fresh Summer Salad to main courses Lollipop Lamb chops and Grilled Salmon in light Dill sauce. For me as an adventurous culinary hobbyist and a bartender, I always believe that “Great food comes with great beverages and great hospitality” Therefore, alongside with the food were the creative cocktails such as Ketel Cucumber Cooler, Ketel One and Finest Call Sours served with a smile by mixologists Cesar Romero and Josh Gates. After dinner, the Q & A took place wherein the organizing committee made sure that each competitor understood every rule and most importantly the scoresheet. The following day was the moment of truth – Finals! Ram Ong’s Asian style Flair was coupled with an award winning cocktail called “Maginoo” meaning gentlemen. This drink was named after his brothers from New York City who both have a great impact in his bartending career (Dacho and Gab). The drink was made of Ketel one, whiskey, Finest Call Lemon Sour, angostura bitters, Simply Squeeze Real Peach and Agave syrup. Manuel Picon is a well rounded competitor of the qualifiers. Besides his technical Flair routines, his mixology side is strong as well. Manuel’s “Nolet Cali” was made of muddled fresh Basil, Ketel One, Finest Call Bar Syrup, Aperol, lime juice and essence of cucumber and served in a chilled couple glass. Master mixologist Danny Seigel impressed not only the judges but fellow competitors with his one of a kind style of mixology. His entry “Frambosa Balsamico” highlighted that Balsamic Vinegar can also be used as a modifier in cocktails. Great job Danny! Florida’s finest Joshua Goldurs won the hearts of the spectators with his “Dop Rock Shandy”. The drink is a combination of Ketel one, Finest Call Bar Syrup, lemon juice, angostura bitters and topped offf with Sirah and u filtered ginger ale. 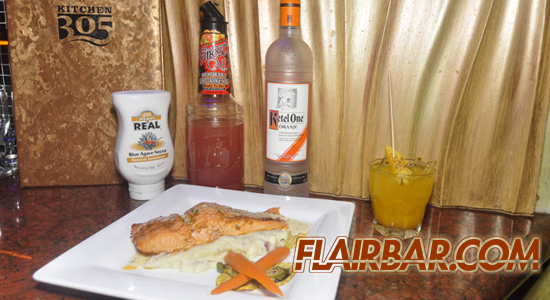 Will Isaza is a creative Flair-mixologist. His unique concoction called “Heatwave” is one of the best tasting cocktail during that round. His cocktail is made of Ketel One, Simply Squeeze Real Agave, lemon juice, Angostura bitters and Ancho Reyes Chile licor. Served in a tall glass then garnished with Orange flower and Atomized Pernod Absinthe. Mariano Gil demonstrated how it is done with his South American Flair style while making his refreshing “Acapulco Joy Ride”. In his cocktail he used Ketel One, Aperol, lime juice, Finest Call Agave Syrup and splash of soda. Eric Parker who was last year’s winner once again rocked the stage with his unique signature cocktail called” A Date with a Rose” which is made of Rosemary infused Ketel One, Finest Call Mango Puree, fresh lemon juice and honey syrup as his sweetener. A good friend of mine Mr. Colby Ashton has been making a name for himself in the world of Flair both local and international. His signature multiple tin combinations has always been impressive. He concocted a cocktail named “Crimson Whale of 83″ which is made of Finest Call Strawberry Puree, fresh strawberries and cucumber, shaken with Ketel one, Campari and St. Germain then topped of with soda. Veteran superstar Dario Doimo (USBG Las Vegas) convinced the judges and was hailed as champion while his closest rival Luis Ortiz (USBG Las Vegas) was adjudged first-runner up. Both gentlemen pulled out a great show and also both dropless. Aside from the $1000 prize money, Dario’s excellent multiple tin routines, technical juggling ability and superb mixology skills earned him the privilege to represent USA in the upcoming I.B.A World Finals which will be held in Capetown, South Africa. 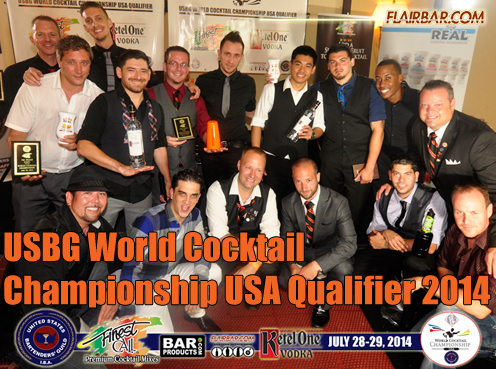 Click “Play” on the video above to watch a preview of the USBG World Cocktail Championship USA Qualifier 2014. Click “Play” on the video above to watch the edited Flairbar.com re-broadcast of the USBG World Cocktail Championship USA Qualifier 2014. I strongly advise professional bartenders to get involve in the United States Bartenders Guild for it is prestigious and beneficial. Membership on the USBG includes monthly meetings, product tastings, hands-on seminars from industry leaders, etc. Before I end this article, I would like to thank USBG for giving bartenders the opportunity to shine, to our generous sponsors for providing the accomodation. And lastly, to our very own Mr. Rob Husted for pouring his time, effort and warm hospitality.